Making your own pastry sheets (phyllo) is a process that needs love and patience. It may seem difficult at first but practice makes perfect and it’s really worth the effort. There are many types of phyllo, multi and one-layered pastry sheets, suitable for savoury or sweet pies and pie rolls. I’d like to share with you everything I’ve learnt so far and I’ll continue with the classic, thin type of phyllo. This recipe produces 8 large, simple and thin pastry sheets, suitable for any kind of pie. Watch the video to learn the rolling out technique and how to preserve the pastry sheets. In the bowl of your mixer put flour, salt and blend. Add the olive oil, the vinegar and half of the water. Start mixing on low speed. Add the rest of the water. Knead on low speed for 3min, then on medium speed for another 4min. Put the dough into a lightly oiled bowl. Cover with plastic wrap and let it rest for 30min. Weigh the dough and cut it into 8 equal pieces. Shape them into smooth balls. Toss each ball in corn starch until it’s well coated. Cover with plastic. Put the first ball onto your working bench. Flatten it with your hand. 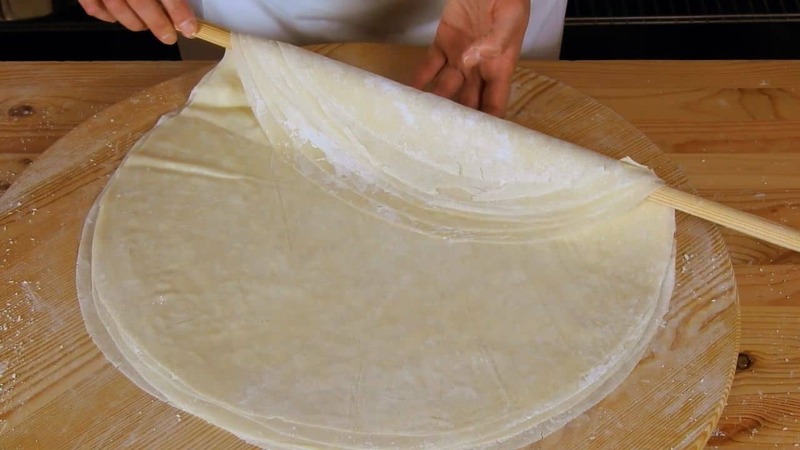 Using a thin rolling pin, start rolling out the first pastry sheet. At first, roll back & front until the sheet gets about 20cm / 7.8” in diameter. Then wrap the sheet around the pin. Press slightly with your fingers, moving your hands from the center towards the edges. Gradually the sheet will get bigger. Its final diameter should be about 50cm / 19.6”. It should be thin enough to see through it. When the sheet is ready, put it between two pieces of plastic wrap sprinkled with corn starch. Repeat the process for the rest of the pastry sheets and stack one on top of the other. Roll them all together forming a large roll. Store them in the refrigerator up to 4 days or in the freezer up to 6 months. Thaw them in the fridge overnight.